Tresemme is the #1 player in the hairspray segment but the category has been in decline since 2011. On top of that, its Millennial target is using hairspray at only half the rate of the previous generation. Its target only uses hairspray now and again for occasions, and hairspray is often associated with a dated look and style that’s stiff and crunchy. Tresemme’s number one barrier to purchase is stiffness. With an objective of changing the perception of hairspray, it needed to show how a woman’s hair can still move after the use of hairspray. Working along with traditional media, digital out-of-home in subways provided the brand with the right format to show off the product and deliver impact at eye level with enough dwell time to take in its message. The one thing that was missing was … movement! The breeze that’s created from the train coming into the station is enough to mess with one’s hair but the brand wanted it to also mess with its model’s hair in its ads. 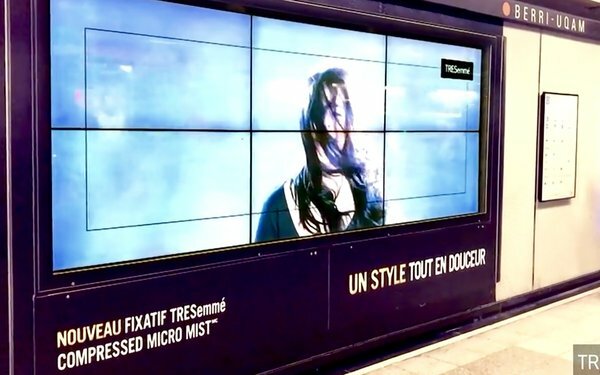 Since the technology didn’t exist to do this, it worked hand in hand with Astral to install sensors in Montreal subway stations that would trigger the ads’ “movement.” Its creative partners filmed its model with her hair looking perfect and moving with the breeze from all sides to account for incoming trains. The result was a seamless execution of the model’s hair that moved with the breeze whenever a train pulled into the station. When the breeze died down, her hair naturally fell back into place, giving Tresemme’s target a real-world example of the product benefit in real time. Utilizing this technology in combination with digital out-of-home, this execution was a first in Canada and required extensive programming and testing to get the timing with the trains and the models’ hair moving perfectly in tandem. Reached more than 324,000 riders daily over 10 weeks. Tresemme sales growth increased by 5%. Tresemme is up more than 16% at partner locations while competition is down 3%. Demonstrate in real-time how a product works. This was a finalist in the Outdoor Media category in MediaPost’s Creative Media Awards.